The Kit Carson designed CRKT M16-10Z is a perfect small-sized every day carry (EDC) work knife. 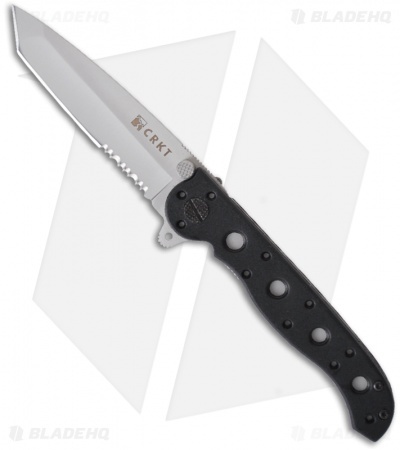 The Zytel InterFrame handle has 2CR13 stainless steel liners and CRKT's AutoLAWKS knife safety, which automatically actuates when the blade is open making it a virtual fixed blade. The handle is slim with black Zytel scales and a tip-down pocket clip. The CRKT M16-10Z features a hollow ground Tanto style blade with a partially serrated edge and a bead blast finish. 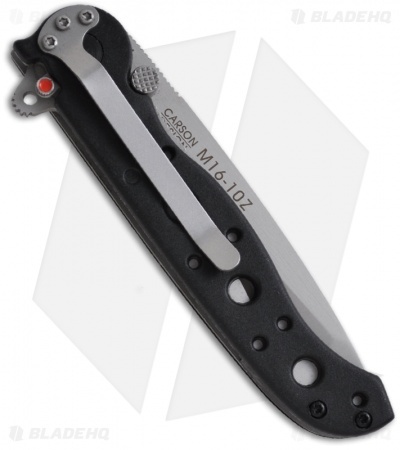 The blade is easily opened with the dual thumb studs or a push of the Carson Flipper and a flick of the wrist. The Teflon bearings at the blade pivot and an adjustable pivot screw allow for perfect blade action. Perfect size for EDC, lightweight and very sharp out of the box. Deploys easy with the flipper and I like the LAWKS system. Have carried and used everyday for a week and has held up good so far, not the greatest steel but a lot of knife for the money. I love CRKT knives. Small for a 3 inch knife which makes it very portable , The clip works well and the blade comes sharp. Blade deploys well and centering is even. At this price a solid buy.